Republican Mark Amodei was sworn in to the House of Representatives by Speaker of the House John Boehner on Thursday morning. 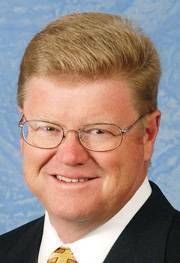 Amodei replaces Dean Heller in representing Nevada's second congressional district after Heller was selected to replace John Ensign in the Senate last May. Speaking of Heller, Nevada's junior senator continues to be outspoken about transparency on the deficit Super Committee. The Committee held its first meeting on September 15, and the meeting was behind closed doors, prompting Heller to comment on his website: "Given the extraordinary jurisdiction of this Committee, meetings should be held in full daylight for the public to see." Las Vegas Sun columnist Jon Ralston writes how Representative Shelley Berkley has awkwardly dealt with her husband's health care connection after a New York Times story raised questions about her possible conflict-of-interest. TransparentNevada recently added public salary data for Ely. Continue checking http://transparentnevada.com/ or follow us @TransparentNV on Twitter for the latest updates.